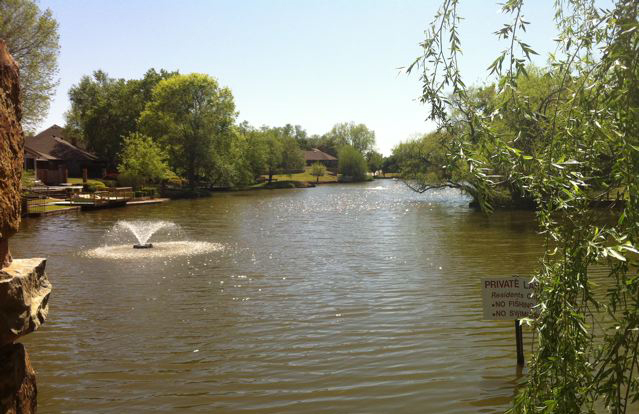 This page highlights the current and historical activities of the Briarcreek Neighborhood. The date for the 2019 Briarcreek Neighborhood Garage Sale weekend will be held the weekend of May 17th. We will advertise on several social media sites and place large Garage Sale banners at the neighborhood entrances to notify shoppers of our garage sale weekend. Garage sale permits are $7.00 and can be purchased on the OKC Garage Sale Permits page. Click here to purchase permits and view the City's garage sale rules. Questions or suggestions for a date? Contact our garage sale coordinator, Camille Glasshof at info@briarcreekonline. Or simply post on a date idea on the neighborhood facebook page. If you aren't receiving our neighborhood emails, please let us know so we can add you to our notifications list. Simply email info@briarcreekonline.com so we can get you on the list. The Annual Briarcreek Neighborhood Garage Sale weekend was held May 18th. Note: Most neighbors held their garage sales on Friday and Saturday.But, a few homes extended their sales through Sunday, May 20th. Many homes participate in this annual event and participants are happy to make a little extra cash while cleaning out the garage and homes of gently-used items. We will place ad in the papers, online and hang large banners to notify OKC residents of this annual neighborhood event. It's a fun weekend for the whole neighborhood. Not only for those participating, but for the garage sale shoppers in the neighborhood as well. It's nice to walk through the neighborhood, connect with neighbors. You never know what treasures you will find at a garage just around the corner. Questions? 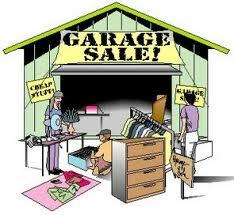 See the neighborhood email to contact our Briarcreek garage sale coordinator, Camille Glasshof. If you aren't receiving our neighborhood emails, please let us know so we can add you to our notifications list. Simply email info@briarcreekonline.com so we can get you on the list! Annual Neighbors Night Out - 2016 - huge success! We had another fun-filled party once again for our annual Neighbors Night Out Halloween / FestiFall Party. Everyone commented on the great BBQ brisket and different food options that were offered on the food trucks. Many of our 50+ year old neighbors came to hear about the new Health and Wellness Center that will be opening in early 2017 and chat with the Director of the facility. Everyone ate, played, enjoyed the live music and was entertained by our wonderful neighborhood kids dressed up in costume. Msgt. Skalla, our always available and greatly appreciated, OKC police representative, was on hand to talk about crime, safety, importance of using 911, and to pass out coloring books and police badges to the kids. The Gray Wold Band was a great addition this year with great music that entertained the crowd for two hours. They even played a special rendition of "Over the Raindow" for our own little Dorothy, from the Wizard of Oz. Kara and Amy, our resident friendly witches, brewed up lots of free cotton candy for everyone. The wind put a stop to some of the activites but it was a wonderful afternoon for everyone. 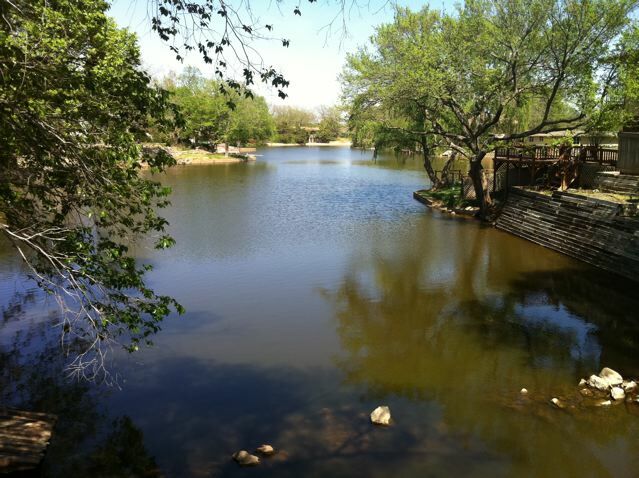 Plan to join us next fall for more fun all in the beautiful setting of the Briarcreek lake. 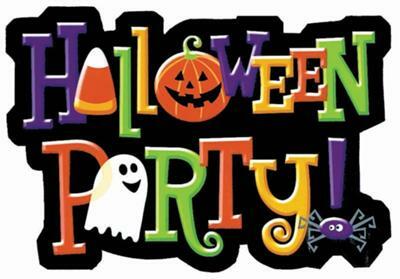 Food trucks, live music, costume contests, cotton candy (served by witches). Lots of fun for young adults, senior adults, families and kids! Check out the Briarcreek facebook page to view photos of the event. (Click the facebook icon on the website to go to the Briarcreek facebook page). We had another fantastic Spring Cleanup Saturday, April 9th. Briarcreek volunteers and more than 30 wonderful student volunteeers from OU's Big Event worked together to cleanup five homes for elderly neighbors and in-need homes. This annual community service day allows us to have student-volunteers work with us, in our neighborhood, to accomplish cleanup of our Briarcreek common areas and work on the homes of our elderly / physically challenged neighbors. Click here to view the photos of the event on the Briarcreek facebook page. - to Briarcreek neighbors who worked and led teams: Bert Orza, Ed and Wanda Reynolds, Polly and Easton Calhoun (and daughter), Susan and Gary Brown, James and Susie Cramer (and their twin girls), and Bob Canary. - to the student-volunteers from OU's big event. Briarcreek is partnering with OG&E again this year on the SmartHours project. We have an opportunity to win $5,000 for our neighborhood, based on the number of residents who sign up for the program. Please sign up for the OG&E SmartHours program. Briarcreek joined the OG&E GREAT Neighborhoods program to help make Oklahoma City an energy wise, clean and green city. In that effort, we are joining forces to reduce electric usage during the peak capacity hours of 2:00 pm - 7:00 pm (the most critical window being 5:00 pm - 7:00 pm), Monday through Friday, June 1 through September 30th. What does this mean for you as a consumer and a resident of Briarcreek? Earn funds for Briarcreek. Our neighborhood is compensated for each resident who joins the SmartHours program and by participating in the program, we are eligibile to win the OG&E Postiive Energy Award of $5,000! Wow, that would be nice! There are two says to sign up for the program. Click here to sign up online. Click the big red Residential button to begin. The first screen prompts for your OG&E account number and last four digts of your social security number. On the next screen be sure to click the bottom question "How did you hear about this?" Select "other" and enter NBRIARCREEK for our neighborhood to get credit. Click here to read more about SmartHours Plus (with thermostat). Click here to read more about SmartHours Plan (without thermostat). 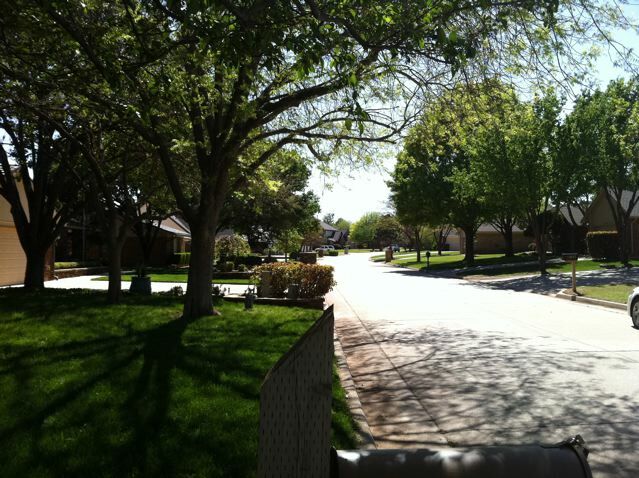 Briarcreek neighbors love the Yard Of The Month program. Many neighbors ride bikes or walk through the neighborhood each month and see who has won the coveted prize for best yard each month. It is a tough decision, but handled professional by Master Gardener and Landscape Committee Chair, Wanda Reynolds and neighborhood, Camille Glasshof. Wanda and Camille do their best to find the one yard, out of the many beautiful yards in our neighborhood, for showcasing. Winners earn a gift certificate from Bethany Feed and Seed. If you see a yard in our neighborhood that should receive the Yard of the Month, click the button below and send us an email. We encourage neighborhood participation and Wanda and Camille would love your input. Click here to view the Briarcreek Yard of the Month winners. May 2016 update: This is still a great project. We've ran into problems and delays, but it would still be a fun neighborhood project and a great resource to have a little library at the bridge in the heart of the neighborhood. Just imagine a free, little library - in the shape of a lighthouse, canoe, or boat. Email us at info@briarcreekonline.com if you can help move this project forward. May 2015 update: Adding benches and a little library are still a goal for the Briarcreek bridge. We think a library designed to look like a lighthouse or boat would be a great idea and tie with the lakes in the heart of our neighborhood. If you can take charge of this project. Let us know at info@briarcreekonline.com. July 2013 update: Briarcreek's Little Library project has been delayed indefinitely. Our volunteer architecture firm, was Crafton Tull. Our architect, provided by Crafton Tull, had some personal issues that caused initial delays, but the final blow to the project came when Crafton Tull closed their OKC offices eliminating our architect's job. We had hoped we might still be able to complete the project, but these events proved fatal for our little library project. But, don't lose hope. We still have plans to create a beautiful seating area and gathering spot at the bridge. Briarcreek Neighborhood is joining with the American Institute of Architects, Central Oklahoma Chapter; the Neighborhood alliance of Central Oklahoma; Barnes and Noble Bookstores; and the Start Helping Impacted Neighborhoods Everywhere (SHINE) project of Oklahoma County. Briarcreek is been selected as a great neighborhood and will receive a free Little Library. At our quarterly neighborhood meeting, held February 2013, we discussed design themes that embrace and build the the beautiful aspects of the neighborhood and our beautiful lake views. Click here for more information on Little Library projects. More than 2,500 Little Libraries have been built around the world and we are excited to be a part of this great program. If you would like to be a part of the design/build team, email us at info@briarcreekonline.com. 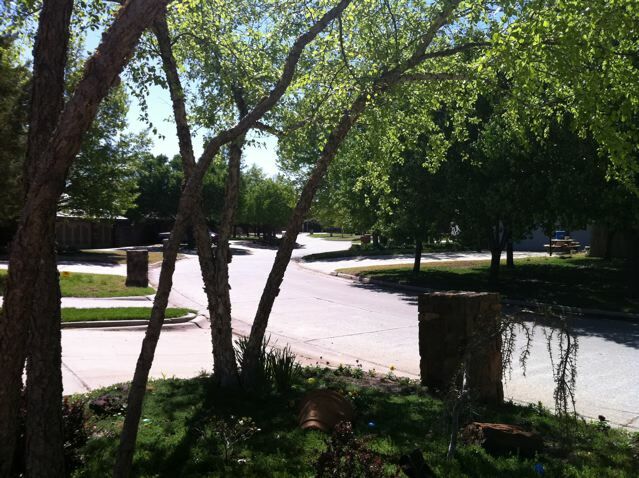 December 2012 update: Congratulations Briarcreek Neighbors! We completed the streetlight project and the new lights look fantastic. Our project was the largest streetlight replacement project OG&E has ever undertaken. Our neighborhood was recognized at the Neighborhood Alliance's Great Neighborhoods awards benquet. Good job everyone! Scope of project: Briarcreek teams worked to upgrade our ugly wooden streetlights with beautiful decorative ones. Our neighborhood has 32 streetlights. During the first phase of the upgrade, there were three streetlight poles that had WiFi antennas used by police, fire and emergency vehicles and could not be replaced. We successfully upgraded 29 streetlights - the largest upgrade project in OG&E history. Update note: In 2015 OKC upgraded their emergency services systems which removed the WiFi attennas from the old streetlight poles. We were able to upgrade the final three streetlights to decorate ones, to complete the upgrade of all the streetlights in the neighborhood. This project is the culmination of a more than a year of hard work by your Briarcreek Neighborhood Association (BNA) board members. We obtained the necessary approvals from the City of OKC (they will pay the electricity for the lights) and agreements with OG&E (they will install and maintain the lights). Thank you again for your overwhelming support. Briarcreek is such a great place to live! Click here to see a smilebox video of the installation. Click here to see the list of locations. Click here to view photos from the project. August 2013 final update: Thank you to the volunteers who helped with the installation of the water drip-system on Rockwell. It was hot, back-breaking work! We were able to complete this job with the help of Briarcreek neighbor, Jim McDowell, who owns J-Mac Sprinkler systems. With his expertise, assistance from his installation crew and hard work by our dedicated neighborhood volunteers – we completed the job within our budget. We now have a watering system on Rockwell for the landscaping that is connected to our own Briarcreek water meter. A shout-out to the residents who live on Rockwell Terrace, who allowed us to use their water to keep the young plants alive during the first two year while we saved and planned this permanent system. August 2012 update: Our Briarcreek Drip system team met in the spring and summer to construct a plan to install a permanent drip system that ties all landscaping along North Rockwell and the two Rockwell entrance beds to the recently installed Briarcreek nieghborhood water meter. We are lucky to have Jim McDowell who specializes in sprinkler system installation heading the team. Due to his busy summer schedule, we are postponing the trenching until his schedule permits, probably late fall. However, the drip team has been able to run a flexible pipe down the 1,000+ feet on North Rockwell and drip each plant so the landscaping is alive and did quite well through the record high temperatures and drought. If you can assist in the fall with this project, please drop us an email at info@briarcreekonline.com. Project details: Briarcreek applied for and was awarded an $8,000 grant from the OKC Community Foundation and the Margaret Annis trust for a beautification project to install landscaping along our neighborhood's Rockwell perimeter. 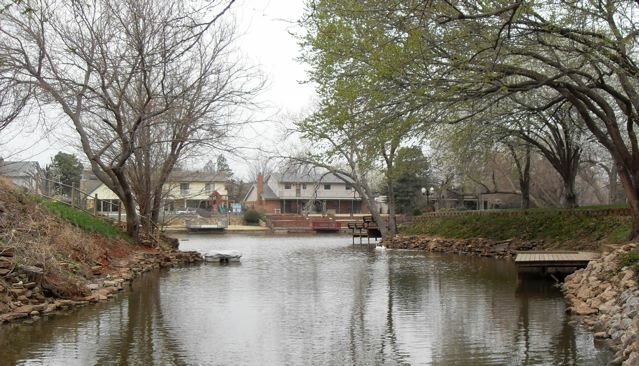 The project required hard work to obtain the necessary permits from the City of OKC and to work with the MANY utilities that run along Rockwell. But, the hard work paid off and our Rockwell perimeter blooms with vibrant Crepe Myrtle blossoms in the spring and summer months, tall tuffs of elegant pampass grass plumes in the fall, and red berries on the dark ever-green branches of the Nellie Stevens hollies in the winter. We owe a debt of gratitude to our many volunteers who worked on on this project and to the wonderful Rockwell Terrace neighbors (who live behind the wall on Rockwell), who allowed us to use their water those first critical years to help get the new landscaping alive. As Oklahoma summers have proven to be exceeding hot and dry, the Briarcreek Neighborhood Association board realized that a permanent solution for watering the landscaping was required. In the early spring of 2012, we installed a water meter that will be paid for from BNA funds. We created a drip system team (Jim McDowell, Gary Brown, Jon Heavener, Chris Hulen, Dan Orza, Susie Brown, Rick Goodson and others), who are engineering the new drip system and installing it. Briarcreek Drive neighbor, Jim McDowell, is working up a detailed plan and we will proceed with the new system installation. If you can help with this project, please send an email to info@briarcreekonline.com. View invitation. Visit the Briarcreek Facebook page to view pictures of previous Neighbors Night Out events. The Annual Garage Sales went ahead as scheduled in May. Our neighborhood garage sales occurred in tandem with Lansbrook and Canyon North. Some residents expressed concerned that it would rain and while we had record rainfall in May - it rained 23 out of 31 days - the weekend ended up with only occassional mists of rain, but most sunny beautiful days. Those who went ahead with their garage sales said they had lots of shoppers and very successful sales. Check here and the Briarcreek Facebook page for details regarding next year's annual garage sales. What a fantastic neighborhood get together! Thank you to all the neighbors who participated. I will try to get photos posted here soon, but check-out the posts from neighbors who have posted on the Briarcreek facebook page. We had lots of adorable halloween costumes and great pumpkin artwork. Congratulations to the happy kids who won prizes at monster bowling, knocking down witches, frankensteins, and ghost pins; at the ring-toss game, where they successfully landed a ring around a frankensprite, dracola, pumpkin juice; and witches brew bottles; and to the winners of the costume contest and pumpkin painting competition. It was a very tough costume competition with so many adorable children and great costumes -- from adorable to amazingly creative! Our neighborhood sponsors: Crest Foods, Panera Bread, and all American Pizza for their donations and discounts on food. Our neighbors who pitched in, planned and worked to make this event a success: The Moore family members (Allie who kept the food table running smoothly, Gabrielle who helped on many activites and was crucial at the prize table and to Ana who helped with the games and anywhere she was needed); Mike and Denice Yardley, Carolyn Sims, Wanda and Ed Reynolds, and our newest member of the BNA team- treasurer, Sherry Fair. Click here to view past stories and pictures from previous Neighbors Night Out events. The Annual BNA Garage Sale was held June 7-9, 2013. It was a fun weekend for everyone. The weather was beautiful and the streets were full of shoppers. Briarcreek neighbors got out and walked the neighborhood chatting and shopping for bargains. Briarcreek residents cleaned out garages, attics and rooms and made a little extra cash. I think we have more home participating each year and lots of shoppers who came to check out the bargains. We had little enterpreneurs who made cookies and homemade lemonaid for sale at their parents and grandparents garage sales. This is an annual event, so check to see when we will hold this activity in 2014. The Briarcreek Neighborhood Garage Sale was held May 13 and 14th. The neighborhood was a busy place this weekend with the streets full of happy bargain shoppers. Thank you Camille Glasshof for a job well-done to notify the local newspapers and organize the event. This annual event is very popular with Briarcreek residents and area shoppers.